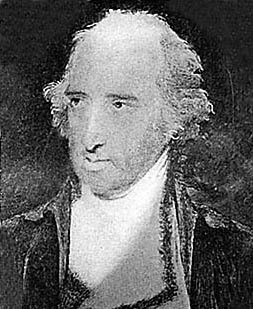 Henry Hamilton was the Lieutenant Governor of Canada and British commander of Fort Detroit during the American Revolution. Hamilton was known as the "hair buyer" because of his policy of paying Britain's American Indian allies for American scalps. Symbolizing the brutal fighting that took place in the Ohio Country during the revolution, both the British and the U.S. engaged in this practice. In 1779, George Rogers Clark captured Hamilton during a raid into modern-day Indiana. He was taken in chains to Williamsburg, Virginia, where he was treated very poorly as a prisoner. Exchanged in 1781, Hamilton later returned to Canada as Lieutenant Governor and Deputy Governor of Quebec. He later served as the Governor of Bermuda and Governor of Dominica. He died on the island of Antigua in 1796. Waller, George Macgregor. The American Revolution in the West. Chicago, IL: Nelson-Hall, 1976.